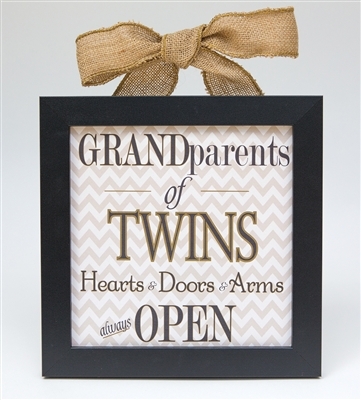 Grandparents of twins will love this adorable sign that proudly displays being a grandparent to multiples. What a great gift for grandparents of twins at Christmas, birthday, or for a grandparent to be gift. Any time it is sure to be appreciated and enjoyed. What a great gift to announce a twin pregnancy to grandparents. Artwork reads "Grandparents of Twins: Hearts, Doors, & Arms always Open" and hangs in a black 8x8 frame with a large burlap bow. Frame has an acrylic front and is perfect for wall or table display. We purchased this plaque for our closest friends' 35th anniversary since their daughter is expecting twins. It is a beautiful item which was packed securely and delivered very quickly. I was very happy with this purchase and would not hesitate to order from your company again.